The littlest Langr is due in less than a month, and Catholic parenthood has been on my mind quite a bit lately. But after listening to a few Catholic parenting podcasts and thumbing through some parenting books, I ended up finding more sources of frustration than encouragement. 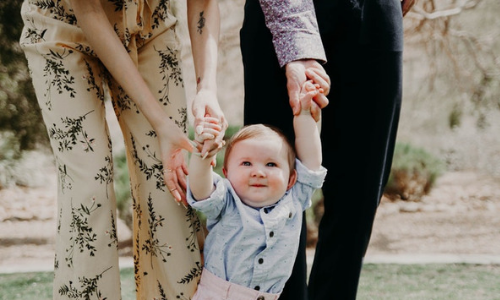 From names to diaper brands, and school choices to parenting styles, Catholic parents have plenty of decisions ahead of them. But we can’t make the mistake of holding up certain choices of others as if those choices are the only right way to strive for sainthood as a family today. You’ll make a lot of decisions as a parent, and other parents around you will make their own set of decisions. While we’re all called to sainthood, our path back to the Father’s heart will look different for each and every one of us - and our families. Regardless of whether you’re brand new parents or child-rearing veterans, here are seven things you don’t have to do to raise a holy Catholic family. Big families are beautiful. Small families are beautiful. Families that don’t have any children are beautiful. Yes, Catholic marriages are called to be total, free, faithful, and fruitful. But family size and how families are grown is something that’s meant to be discerned between spouses and the Lord. How many kids you do or don’t have isn’t meant to be a gauge for those around you to figure out where you fall on the holiness scale. The Holy Family consisted of three people. Other beautiful Catholic families (like the Martins!) had nine children. Catholic families come in all shapes and sizes. “The right and the duty of parents to educate their children are primordial and inalienable,” the Catechism reads. But what you won’t find in the Catechism is what educational path is right for your family. That’s because there isn’t one, right way to educate your child. Yes, parents have the responsibility for the education of their children in the faith, prayers, and all the virtues. They also have the duty to provide as far as possible for all the physical and spiritual needs of their children. But some families are called to homeschool their children, and that is a good choice for them. Others find that Catholic school or public school works better for their child and their family as a whole, which is also a choice that could be the best fit for their family. Just like there’s no one, right way to raise a Catholic family, there’s no one right way to provide for them, either. For some families, a stay at home parent is the best choice. For other families, multiple incomes are necessary. And while some parents work because they have to, others work because they want to. That doesn’t make them any less or more holy than parents who desire to stay at home, or make that choice out of necessity, either. Catholic families striving for holiness discern what’s best for their family. It may look different year to year, or even month to month. But there is no one, right way to provide for your family, or a mold that exists within the Catholic Church that every holy family is expected to fit into. “The Christian family constitutes a specific revelation and realization of ecclesial communion, and for this reason it can and should be called a domestic church,” the Catechism reads. But just like not all churches around the world look the same, domestic churches aren’t going to look the same either. Celebrations of the liturgical calendar look different in every church. But the beauty of one church doesn’t take away from the unique beauty of another church. In fact, all churches (including the domestic ones!) are called to reflect the love of the Father. Some families thrive in the beauty of liturgical living, and I love reading about their celebrations. But if you struggle to remember to light an Advent wreath candle, that doesn’t mean that your family isn’t striving for holiness, or that you don’t want your children to have a relationship with the Catholic Church and the beauty of the faith. There is no one, right way to live liturgically, just like there’s no one, right way to strive for sanctity during our life here on earth. There’s no one handbook that the Catholic Church gives to parents at Baptism - at least, that I know of. We haven’t reached our day of baptism yet with this baby, so maybe I’m in for a shock. But as far as I know, there isn’t a guide saying you have to say a daily Rosary, go to daily Mass, or read a certain set of books in order to be a holy, Catholic family. Are these beautiful practices that work for some Catholic families? You bet. But they’re not cookie-cutter fits for everyone. There are some non-negotiable in the Catholic faith (like going to Mass on Sundays and Holy Days of Obligation), but the Church allows us the freedom to choose our devotions in many situations. Your family prayer life will look different at various stages raising little people. One day you may be able to sit down and pray the Rosary with them, the next day they’re running around and can’t be present for a few Hail Mary’s. It’s okay. Take it a day at a time and don’t be afraid to explore all the options that you have for fostering an intimate friendship with Christ in the lives of your kids. It won’t look the same for every family, and it may not even look the same for different kids in one family. You’ve got options! Even if you’re striving for sanctity with your family, your kids won’t be perfect. We’re all human, we all make mistakes, and we all hurt each other. A holy family doesn’t mean a perfect family. In fact, you can strive for holiness with your family, never miss Mass together, have open and honest conversations, and your kids may still break your heart and choose to leave the Catholic faith. But that doesn’t mean that you didn’t strive for holiness when you raised your family, or that you’ve stopped striving for holiness even after your kids have moved out of your home. We’ve just started raising the littlest Langr, but I can guarantee you that I’m going to make some mistakes as a Catholic mom. Some of those mistakes will be small, and some of those mistakes will be big. Even though I’m striving for sainthood as a wife and as a mom, I’m still human, and so are you. You don’t have to put up a facade to make everyone around you believe that you have it all together. None of us have it all together. It’s okay. The decisions we make as Catholic parents are a big deal. After all, God has entrusted us with these little souls and our goal is to get them to Heaven. But we should be able to make those choices out of freedom, not out of the fear that there is one, right way to raise a Catholic family today. If your Catholic family doesn’t look like the Catholic family who sits in front of you Sunday at Mass or the family that you read about online, that’s okay. Every single Catholic family brings something to the table with our unique set of charisms, gifts, talents, and struggles. Your Catholic family is called to build up the kingdom of God in a way that another Catholic family can’t.